The restrictions of the low-FODMAP diet can be tough for anyone to comply with. Add those restrictions to that of a vegan diet and things can be quite challenging. Vegans who want to benefit from the diet need all the resources they can get in order to be successful. 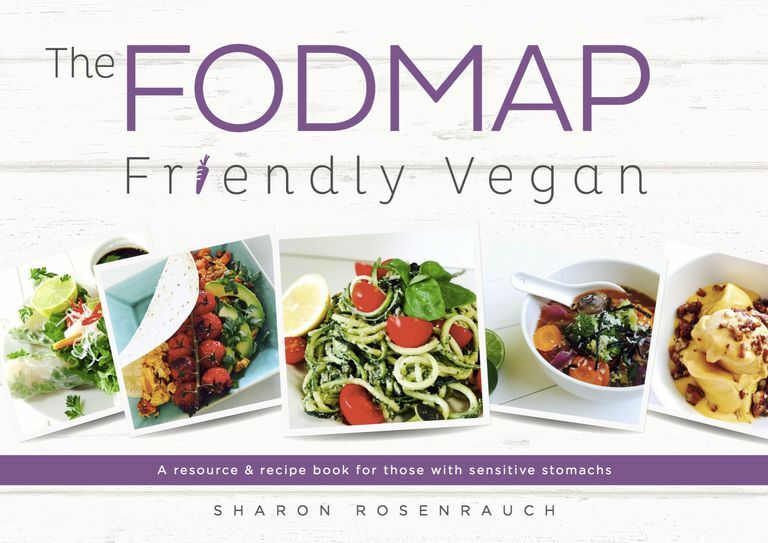 The FODMAP Friendly Vegan, by Sharon Rosenrauch, fits the bill perfectly. Ms. Rosenrauch's cookbook starts with a discussion as to how she learned to successfully use the diet to manage her IBS symptoms in spite of the special challenges she faced as a vegan. The book includes a brief overview of the diet, as well as high- and low- FODMAP food lists, before showcasing recipes for breakfast, snacks, salads, soups, mains, and desserts. Throughout the book, Ms. Rosenrauch emphasizes the importance of wholesome nutrition and whole food ingredients. Recipes are beautifully photographed and look delicious. Sharon Rosenrauch is a vegan who found relief from her digestive symptoms after working with a holistic nutritionist/dietitian. She runs the site thefodmapfriendlyvegan.com. She has a degree in psychological science (majoring in health psychology), and a master's degree in nutrition. She is also a certified yoga instructor. The book includes a wide range of healthy, quick and easy recipes. The recipes included illustrate how even a vegan, low-FODMAP diet can be well-rounded, providing a full range of important nutrients. Ms. Rosenrauch shows how "eating healthy" does not have to be expensive or time-intensive. She includes a lot of practical advice for following the low-FODMAP diet in the real world. She also offers tips for setting up a wholesome kitchen and provides a list of some of her favorite nutritious staples. She has thoughtfully and uniquely added a neat bonus section of five easy yoga poses with a reputation for enhancing digestion. These are poses that anyone could do, even those without any previous yoga experience. The book provides lists of other low-FODMAP diet resources. One quibble could be that like many cookbooks, there is an overabundance of sweet recipes. The book is only available as an eBook. You don't have to be a vegan to enjoy the recipes provided in The FODMAP Friendly Vegan. Preparing and enjoying these simple but nutritious meals will enhance your overall health, as well as to help to keep your IBS symptoms quiet. If you are a vegan with IBS, this book is a must-have. You will feel that you have a friend and compatriot in Ms. Rosenrauch. She will lead you away from the world of IBS-unfriendly processed foods into a way of eating that you can feel comfortable with and confident about. Is the Paleo Diet Really Right for You? Are GoodBelly Juices a Good Way to Get Your Probiotics?